When it comes to tax refunds, many Americans say they plan to do something virtuous with the money they get back from Uncle Sam, like pay down debt or put it in the rainy day fund. We're not completely fooling ourselves: Experts say people who plan to save their refund or use it to pay off bills do that -- with at least part of the money. But whether we realize it or not, having a little extra money in the checking account also often leads to a splurge or two, like a new pair of shoes or a nice dinner out. "You also find significant spending among households who say they're saving it," said Jonathan Parker, a finance professor at MIT's Sloan School of Management who has studied how people spend money they get back from the government. It's not clear whether people are aware that they are spending a bit more than they otherwise would have. %VIRTUAL-article-sponsoredlinks%Parker said people may just see that their bank balance is a bit higher, or know that they just deposited that big check, and feel comfortable spending a bit more even a month or two later. "It actually caused spending even though you think you saved it," he said. 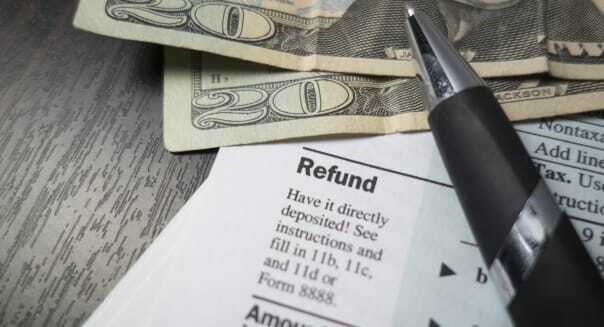 For many Americans, a tax refund is a significant financial boost. The Internal Revenue Service said Thursday that it had issued more than 40 million refunds already this year, and the average refund so far is $3,116. Many people plan to use those refund checks to get their financial house in order. A survey released this week by financial services firm Edward Jones found that only 8 percent of respondents would spend a tax refund on something fun, like clothes, entertainment or a meal out. By contrast, 52 percent of those surveyed said that if they were to get a refund this year, they'd spend it on necessary items, like household expenses or credit card debt. Thirty percent planned to save it, and 8 percent planned to invest it; 2 percent weren't sure. The phone survey of 1,018 Americans was conducted earlier this year and had a margin of error of 3 percentage points. Parker said if you really want to make sure that you are actually saving your refund, the best thing to do is to put it in a place where it's hard to get to, like a mutual fund account or a retirement plan. If you just leave it in the checking or even savings account, it's too easy to dip in, even unintentionally, for nonessential expenses. Still, Parker said there's not necessarily anything wrong with using your tax refund to splurge a bit -- after all, an indulgence here and there can make you happy. It's only a problem if you do something like go on vacation instead of paying that overdue credit card bill or just end up regretting frittering away the money. "[If you're] not paying your utility bills, then you ought to be thinking differently," he said. Should You Merge Your Assets?